Sonia Kruger was the first significant celebrity (unless you put Pauline Hanson in this category) to suggest that perhaps we should stop Islamic immigration, at least temporarily, until the terrorism issue is settled. So Sonia was being everywoman, and was excoriated for it by many of her peers, with only a handful standing-up for her right to hold that opinion. I wondered if she would survive, and thought she was actually pretty brave to put such a point of view. It seems now that Sonia was more in tune with the nation than all the highly paid commentators interpreting the world to us. The only surprise in the Essential poll really is that the ALP and Greens voters are now more concerned than they were, but concern was always there. 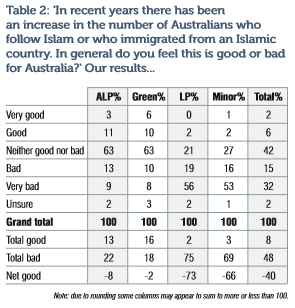 No doubt this poll will be met by condemnation of Australia and we will be told that not all Muslims are terrorists. But none of this 49% thinks they are. They just think that if even if a couple of percent of them might become radicalised, it is not a smart idea to be allowing any of them into the country. We apply the same types of policies to our borders when it comes to quarantine, so it oughtn’t to be too difficult an idea for the mass of self-selecting public intellectuals to get their head around. If people are looking for other reasons why so many are concerned about Islamic immigration then they might read our report. We look at motivations and find a variety, including the idea that Islam is at war with the west, its treatment of gays and women (particularly motivating for Greens voters), failure to assimilate in Australia, their religion, and the culture in some Islamic countries (as distinct from Islam itself). Australia has been sleep walking into a crisis with too many putting their fingers in their ears and saying “lalala” while refusing to listen to many of their countrymen and women, or give them any credence for having a defensible point of view. Sonia Kruger may mark the inflexion point when this became no longer possible, and if not her statement, then perhaps the inflexion point will be this Essential poll. It seems now that our noisy social commentators and the MSM may need to take a fresh look at where they stand. The attitudes of the general community reflect a genuine concern for the communities safety and the future of our country. Open boarders have been a complete failure in Europe and if we are not careful we will end up in the same bucket. Look at some of the western suburbs of Sydney. I don’t believe that is what Australia should look like. Everybody has a right to hold an opinion and others to hold a contrary view! And summarized by a Senator of legend, Who alleged spoke thusly, Sir, I disagree most vehemently with everything you say, but would lay down my life for your right to say it! As for Sonya’s position, I share similar concerns, many of which would be placated by the rollout of completely covert space age (unbeatable) lie detection technology at all entry points, the SES, banks and places that issue or confirm identification, medicare entitlements/reimbursements, drivers license, (new or existing) or records, deaths, births and marriages! This high tech hardware looks at entirely involuntary responses even seasoned compulsive liars and your average psychopath can’t hide! One recalls how easily American front line custom agents were fooled by clean shaven, affable, smiling young men, dressed in business suits and presenting impeccable documentation! Which included PHD’s? Who were waved on through by front line security, who allegedly could smell a fake from a mile away!? The nose knows, seems to be all that they relied on, as we seem to, even in the aftermath of the destruction of the twin towers, accomplished by the very same smiling assassins! Why? Because they come from a completely incompatible, inculcated from birth, blame shifting culture, that is profoundly obsessed with spreading everywhere and dominating all else! When the compulsive liars in our midst and seeking entry, can be irrefutably identified and without question, sent packing? Then time enough to alter our stance and open this can of worms once again! ?